Joleene Naylor tagged me in one of her posts about a million years ago and it’s taken me this long to respond to it. (She’s pretty awesome, by the way. Go check out her blog. I’ll wait.) So yeah… That’s how crazy the last few weeks have been. I’m WAY behind on stuff. I’ve been working, and working, and then I work some more! I’m hoping things will settle down soonish. *Keeping fingers crossed. * Lots and LOTS of changes have been going on in my work life which is partially why I haven’t written anything more significant than my signature in the last month, and even that’s looking sloppy. But what can you do? Bills must be paid. Got to grab the over-time hours while they’re available. Yada-yada-yada! I don’t usually post pics of myself. I took me YEARS to post one on Facebook. I know I’ve NEVER posted my pic on here, but what the heck! I just turned 39 years young. Yay me! I don’t like having my picture taken. I always seem to make an oddball face for the camera. Seriously! I think I need to practice or something so I don’t look like the “crazy cat woman” when I’m on camera. Everyone knows someone who’s like this. Well…that’s me! It takes a LOT of pics to manage to get ONE “good enough” picture of me. It’s not in my head. I drive everyone nuts! “Maybe we should take another picture?” is the norm. I just go with it. It’s not the photographer’s fault or the camera’s; it’s me. Hubby is even worse. He can’t smile right when he knows the camera is there. We only have a couple of “nice” pics of the two of us together. This is what hubby wakes up to in the morning. This is the “realistic” pic of me. 🙂 It kind of looks like I’m wearing a REALLY bad weave. Yikes! But…hey, I’m not making a weird face. Yay!!! 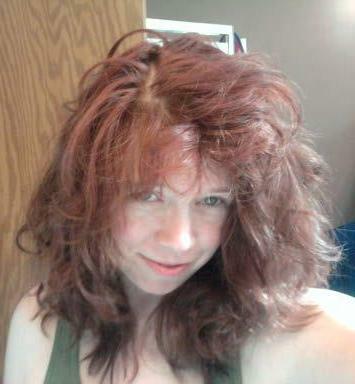 I don’t usually wear my hair down because when I do, my hairstyle seems to get bigger and bigger as the day progresses. It’s pretty funny. 🙂 Most of the time, I pull my hair back or up in an effort to contain it all, but It still has a mind of its own. I often wear my hair in a bun or ponytail. I’m a low-maintenance kind of gal at heart. Little or no makeup is the norm. Most days, I can be ready and out the door in under 10 minutes. 1. My favorite ice cream is Breyers Mint Chocolate Chip. 2. My “new” favorite beer is Samuel Adams Maple Pecan Porter. It’s a dark, full-bodied beer, and tastes a little like pecan pie with hints of chocolate and coffee. Delicious! 3. A good 40% or more of my clothing comes from the men’s department. Yup! It’s not a secret. They’re just clothes. For me, It doesn’t matter what side of the store they were originally hanging in. As long as they fit, who cares? In general, I think men’s clothing are usually constructed better than women’s. For instance, I think men’s flat fronted dress pants tend to fit women BETTER than the women’s version. They’re priced better, they have more options available, they drape nicer, you can FINALLY get the right length, and they seem to fit women’s curves and tushies better than the women’s version. I know several women who’ve come to the dark side…err…the men’s department and we all love the way men’s dress pants fit! If you’ve been dress pant challenged in the past, I strongly suggest you look in the men’s department. They’re awesome!!! Showing off some thrift shopping finds! 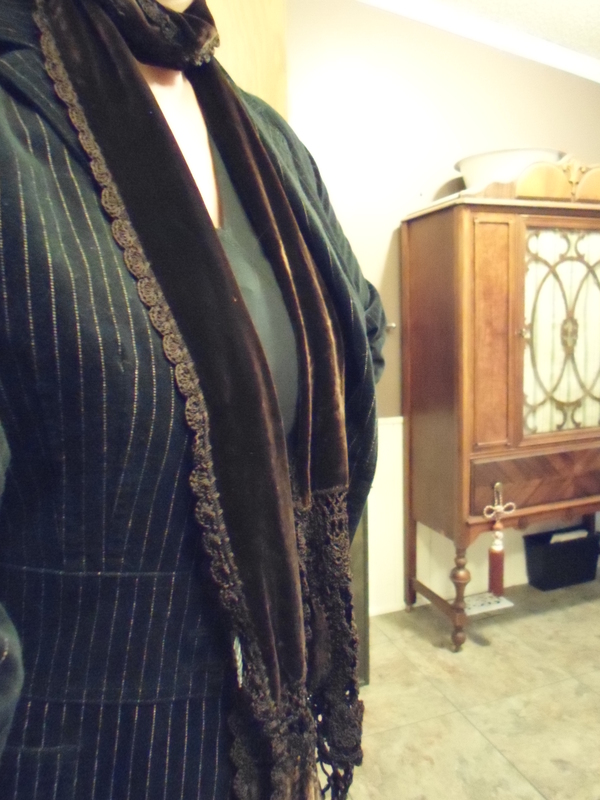 Chocolate brown top and a velvet scarf: $3.40 for the pair. 4. 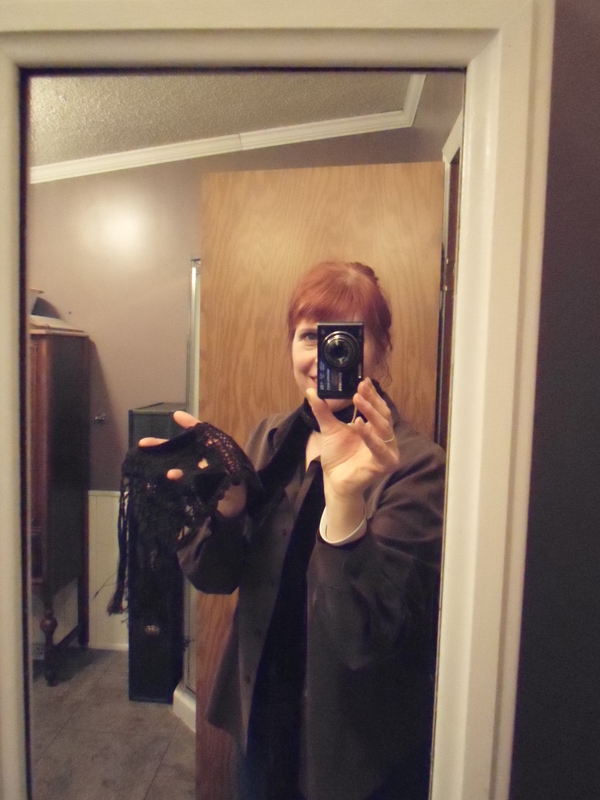 I love “girly” accessories: scarves, hats, vintage costume jewelry. I love mixing up styles. If I wear a dress shirt from the men’s department, I might pair it with something feminine looking like faux pearls or a chunky beaded necklace from the 1940’s. I like that retro look. I don’t shop at the mall, so I don’t really care what traditional retailers think is “in style.” That’s one of the reasons I love vintage so much. As long as it looks purposely done, I think it works. Then again…I don’t have to look at myself! He! He! In my opinion, fashion is mostly about confidence. No one’s body is “perfect.” You take what you’ve been given and you roll with it! Throw out those ratty/stained t-shirts!!! It’s just as much work to take care of clothes that makes you feel good about yourself as it does unflattering ones. You don’t have to spend a lot of money. I certainly don’t. I’m not too proud to shop in thrift shops, discount stores, and whatnot. I don’t have the budget to do otherwise. 5. I love musicals. I love the theater. I love anything on stage. Les Misérables is my favorite musical. It’s pure magic!!! 6. I can get really obsessive when it comes to tangents. The other week, I watched a movie that was supposed to be based off a true story. I looked up the movie to see how much was true, and wound up reading about 80% of the courtroom transcript. I learned some really fascinating stuff…but yeah… Who does that? Ummm…nobody. Gesh! 7. I grew up watching old movies the same way other kids grew up watching cartoons. OK, so I watched cartoons as well, but I also watched a TON of classic movies. Oh! And Creature Feature!!! Every weekend. I think I was only 6 or 7 when I first saw Alfred Hitchcock’s The Birds. The Ghost and Mrs. Muir is STILL one of my favorite movies of all time. A story about a woman trying to make a living as a writer, living in a ghost infested house in the early 1900’s, what’s not to love? If you haven’t seen The Ghost and Mrs. Muir, it’s on Netflix. I highly recommend it. 8. I make jokes about everything. EVERYTHING! Weddings. Funerals. Nothing is sacred. I grew up in a family where humor was just a normal part of everyday conversation. I don’t take myself seriously and I generally don’t take others too seriously either. Life’s short and often ridiculous. If you can’t look life in the face and have a good laugh, what’s the point? Sometimes you have to laugh to keep from crying. 9. I love “Indie” music. The Shins, Cake, Beck, Band of Horses, Arctic Monkeys, The Pixies, The White Stripes, The Black Keys, Vampire Weekend… OMG! The list could go one and on. I love music. Period! 10. I’ve been a manager, of one sort or another, for close to twenty years. How wild is that? They let me be in charge of stuff and I don’t even pass out sharpened pencils and scissors for everyone to run with. *There’s always next week… Hmm… 😉 Most days, I like my job. I really do. Honest! But…there are times that it can be a challenge. I have to say, I’ve NEVER had a dull day at work. EVER. Sometimes, it feels like I’m the ringmaster at the circus. Sometimes, being a manager is REALLY hard work! In my experience, there are two types of managers: The kind that stay clean and push work off onto other people and the kind that get in there and WORK right alongside their employees. I start out clean and come home looking like I played in the dumpster. Guess which kind of manager I am? LMAO! 1. advocating social, political, legal, and economic rights for women equal to those of men. 2. an advocate of such rights. Don’t get me wrong, things ARE getting better. I truly believe that. Even in my own lifetime, I’ve seen changes happen that make me smile. Even the generation 10 years younger than myself, hasn’t seen the kind of discrimination I ran into when I first joined the workforce. Perhaps my experiences have colored my perspective in a different hue because of this. I’ve had some illuminating conversations with my coworkers, both younger and older! Crazy stuff!!! The younger ones often take things for granite that I had to FIGHT for, while the ones from my parents generation will tell me that I don’t even know what real fighting for your rights is!!! Isn’t that something? Stereotypes are crumbling, but it’s NOT an instantaneous process. Ocean. I’ve been to the Atlantic Ocean, when I was in Florida. I’ve been through the Rocky Mountains in Tennessee. Both are surreal in their vastness. And yet…both give me a HEALTHY dose of respect. I would be nervous to go out in a boat on the ocean. I’d also be nervous to be the driver on another mountain adventure. I appreciate BOTH better from a distance. 2. Are you anything like your astrological sign? I’m SOOO much like my sign, a Taurus. I can be very “bull-headed” and stubborn. You don’t want to upset me! YIKES!!! I’m also hardworking, like an ox. Yup! I said it. Ox. I work, and work, and work… I wouldn’t know what to do with myself otherwise. I’m also very rule orientated. Show me where the “fences” are, and I’ll be happy to stay on the right side of them. Of course, if your fences are too weak, think wishy-washy people, I’ll bulldoze right over them. I HATE wishy-washy and indecisive. Better to make a wrong decision than none at all. I tend to attract people with strong personalities to me, people who are similar to myself. Maybe it’s the herd mentality. Mooo? He! He!!! On the other hand, I’d rather have a well thought out disagreement than be surrounded by people who tell me what they think I want to hear. That’s infuriating!!! I enjoy diversity, be it in religion, philosophy, ethnicity, or whatever, I love learning about other people. In my opinion, if you take the time to look, people are more alike than they are different anyways, but diversity adds flavor. I’m a strong believer in being kind to others and “karma.” You attract to yourself what you put out into the universe. If you’re kind to others, I believe you will eventually find yourself surrounded by kindness. 3. What is one thing you wish you had/hadn’t done? I wish I’d gone away to college. I wish I’d had the chance to live on campus. I think that would have been good for me, healthy. I paid for my own schooling while I lived at home, but I would have liked to have had a little more time on my own to get “my head screwed on straight” before I got married. I brought a LOT of excess “baggage” into our marriage. I know I haven’t always been an easy person to be married to. I probably needed more time to figure out who I was before I settled down. My hubby is an amazing man. He’s patient, and loving, and encourages me like no other. He’s held my hand through a LOT of bad times, but sometimes I think if I’d gone away to school, maybe things would have gone smoother, especially early on in our marriage. *Incidentally, hubby helped me pay for our first apartment, before he moved in, so I could have the “experience” of living on my own for a couple of months, all by myself. His idea, not mine. He didn’t move in with me until after we were married. Back then, I didn’t understand the importance of having a buffer window of alone time before making the commitment to marriage. Hubby did. He didn’t want me to have any regrets. That was his wedding gift to me. Yeah, he’s awesome like that! 😉 Sometimes he understands what I need versus what I want better than I do!!! He’s very intuitive. 4. Have you ever broken a bone? Yes. Yes. And…yes! I’ve broken both the ulna and radius on my left arm. I’ve got two snazzy titanium plates still inside that arm. Not you’re typical souvenirs, but they’re mine. I paid for them. I’m keeping them in there. I’ve broken my foot at least once, though I’ve never gone to the doctor for any of my foot related injuries. Oh, the wonders of horses, heavy pieces of furniture, and a stubborn nature! Poor feet and toes have been stomped and had things drop on them…too many times to count. But I’ve been fortunate there. After all of my foot injuries, I’ve still been able to walk on my foot and wiggle my toes. Left foot does look a little different than right foot after one of my injuries. It’s not obvious, but I know it’s a little flatter looking on the one side. It feels fine. It doesn’t give me any problems. 5. What’s your favorite book of all time? I’ve read soooo many great books over the years. It’s hard to choose only one. But if I look on top of the chest of drawers that sits beside my bed, my reading pile, the one that’s sat there the longest is: Bohemian Manifesto A Field Guide To Living On The Edge by Laren Stover. I’ve gotten a LOT of mileage out of this book. I’ve read through this book way too many times to count! Does that make it my favorite? If I take sentimentality out of the equation and look at my actions alone… Maybe? I picked it up at a discount story because it had an odd title and an interesting cover. Artwork inside it is beautiful. It’s a nonfiction book filled with quotations, poetry, must read lists, and an anthropological look at the bohemian lifestyle. This is the book that made me think, “Holy crap! There are other people like me? I’m-dare I say it-NORMAL! Whoa!! !” So “normal” might not be the right word, but I’m definitely not alone. Sure, most of my close friends and family have bohemian leanings, but this is the book that made me feel OK about my counterculture way of living life. My preference for vintage, re-purposed, and recycled just about EVERYTHING is acceptable…at least it is if you’re bohemian. 6. If you could write anything, even things you’re not normally good at, what would it be? I’d loved to be able to write something that resonates with other people. Once in awhile, you read a book that make you go, “Huh? Whoa! This writer…KNOWS. They get it. They understand.” Yeah. I’d love to be able to write like that. Oh, and if I could make someone laugh at the same time? Even better! There’s a fine line between funny and stupid. I used to think it would be great to be able to write in a “serious tone.” Not my forte. But when I look at my FAVORITE books, they all have a bit of humor thrown in there somewhere. I love writers who can laugh at life. 7. What was your best Halloween costume? 8. Have you ever done anything weird to your hair? My hair has been every “natural” color but blond, and once I colored it a deep shade of purple/burgundy. I’ve worn it so it was down to my waist, and chopped it off so it was even with my jawbone. My hair grows out fast and I have little respect for it. I usually cut it myself when I feel like it, and color it when the “silver stripe” grows long enough to annoy me. This could be anywhere from two weeks worth of growth to two months. 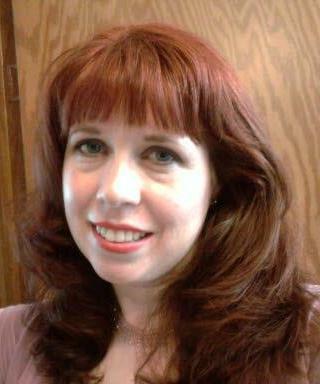 I’m not loyal to any brand of hair color, though I’ve been using L’Oreal’s Feria: 56 Brilliant Bordeaux for a while. I like being a redhead. 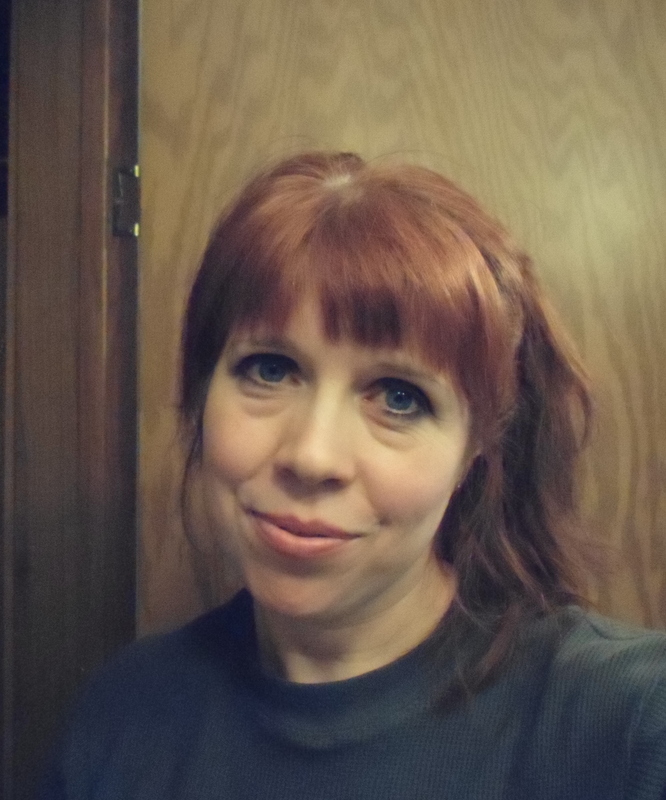 My natural color was deep dark brown, almost black, before it turned silver, but that was over 20 years ago! It’s a pretty shade of silver. Once my hair turns a solid color again, I think I’ll just embrace it. Until then, I’m hitting the bottle! I’ve used $2 hair color and $20 hair color. They’re all the same to me. 9. If you were stranded on a desert island, how many packets of crackers would you take? Unless there’s chili on this island, what’s the point of crackers? 10. What is your ereader of choice, or do you still like paper books best? I like my Kindle Fire. Sometimes I wish it ran a little faster. An ereader is NOT a laptop. I buy all of my ebooks on Amazon. Some of the newer ereaders look really interesting, but since I’m already heavily invested in Amazon’s ebooks, we’re talking HUNDREDS of books, my next ereader will also need to be able to use Amazon’s platform. Sorry Nook! I still buy paperbacks and hardcovers, but not as many as I used to. Even after donating a bunch of books to the library, we still have hundreds of those as well. We’ve got bookcases wedged into every room and they’re threatening to take over! Yay books!!! I wish there was a way for my hubby and I to be able to make more money and still have plenty of time with our kiddo. It’s so hard, balancing work and family. You work more hours to get more money coming in, but then you’re family suffers because you’re never there! We’ve made sacrifices in the past. Sometimes TIME is more important than money. Hubby and I are frugal people, but there are ALWAYS bills that need to be paid. Yuck! This is an issue I think most people struggle with since we all have families of one sort or another. What’s your favorite vice? We all have at least one. (I have loads…but they’re all legal. 🙂 ) What’s your favorite thing to indulge in, but probably shouldn’t? Hobby you wish you had more time for? *Hint you’re probably haven’t worked on it in a while. Favorite piece of advice you’d like to share? I steal a lot of hubby’s clothes as I think the shirts are more comfortable, and you’re right, they are better constructed; they tend to last longer. I think women;s clothes are made more to wear a couple times then toss out because it’s “out of fashion”. What’s your favorite vice? We all have at least one. What’s your favorite thing to indulge in, but probably shouldn’t? -went to the park, watched x-men, hung out with mom, worked on book covers and formatting, catching up on email, etc. “-everything is better with a muffin.” LMAO!!!!!!!!!!!! !